Born 1942 in São Paulo, Brazil, where he lives and works. Born and bred in São Paulo, Marcello Nitsche began his artistic training at the School of Fine Arts Armando Alvares Penteado. In the mid-1960s he became increasingly drawn to painting, under the growing influence of the neo-figurative movement and the aesthetics of pop art. After the military coup in 1964, Nitsche’s works began to reference overtly political themes such as the financial relationship that tied Brazil to the USA and the Vietnam War. Between 1966 and 1967 he frequented the REX Gallery where he met artists Wesley Duke Lee, Nelson Leirner and others. An integral part in REX’s operation was spectator participation and the construction of environments, which greatly influenced Nitsche’s output. In 1967 he participated in the exhibition at the Museum of Modern Art in Rio de Janeiro, New Brazilian Objectivity, and won several painting awards across Brazil, which established his place among the Brazilian avant-garde. 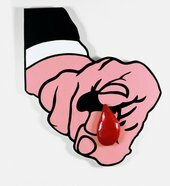 I Want You 1966 appropriates the USA’s iconic military recruitment advertising campaign’s slogan and its unmistakeable pointing finger – also adopted by Roy Lichtenstein earlier in the decade. The addition of a drop of blood made from stuffed painted canvas hijacks the image’s traditional meaning. While in the USA the image was unavoidably connected to military recruitment, in Brazil it invoked the cultural and political imperialism that it exerted: by 1966 the USA was highly invested in the Vietnam War, and just two years earlier it had largely subsidised the military coup in Brazil. Similarly, Kill Fly 1967, a suspended papier-mâché sculpture of a giant hand holding a fly squat, also plays on the notion of command and punishment. First exhibited at the IX São Paulo Biennial, remembered as the Pop Biennial, Kill Fly seeks to further involve spectators by placing them at the mercy of a larger entity, ready to punish, squat in hand. Interview with the artist Marcello Nitsche, included in the World Goes Pop exhibition at Tate Modern.